It’s difficult to control a behavior when you don’t always realize when or why it happens. Skin picking and hair pulling are often habitual, and can happen both consciously and unconsciously. People often tell me that they have been picking or pulling for so long they do it without even thinking about it. Many describe a trance-like state in which they’re unaware they are picking and pulling. 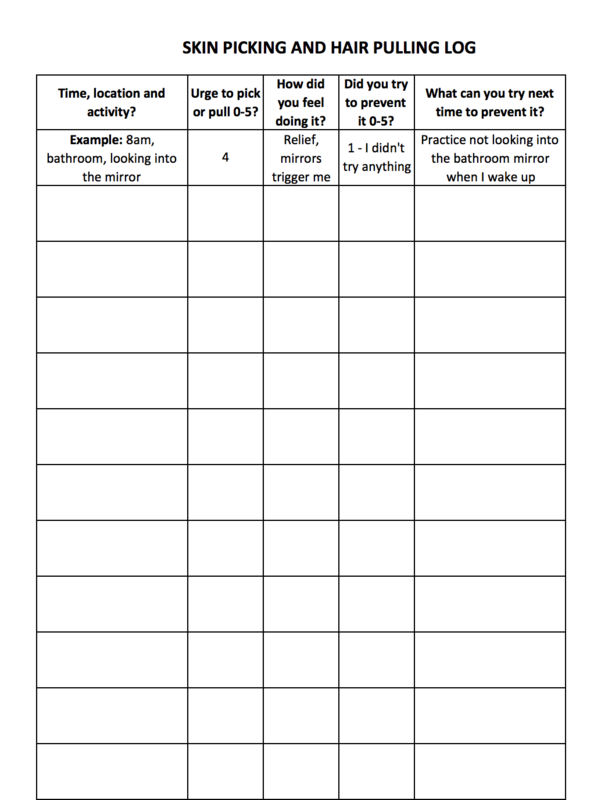 If you want to manage a behavior, it’s important to have a thorough understanding of when it occurs. Fill in this skin picking and hair pulling log to increase your understanding of when and why you pick or pull. Thank you, Mednick. I’m happy you enjoyed the article. I plan on continuing to discuss psychological aspect of skin conditions that unfortunately, do not get discussed enough. the opportunity, Guess I’ll just bookmark tɦis page.